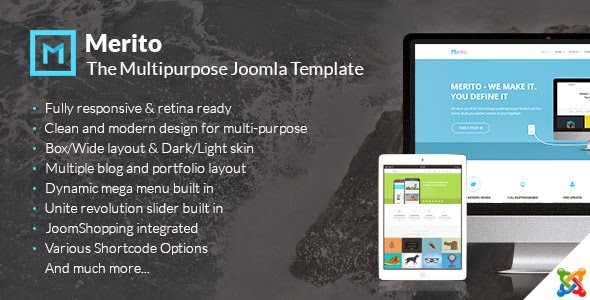 Merito is an multipurpose Joomla Template with clean and flexible design. The template is available in Joomla 3.x, completely responsive and versatile with full functions to enable you to create your website effortlessly, whether it is business, corporate, portfolio, landing, shop or any other types you want. Bootstrap3, HTML5 & CSS3, K2 and Unite Revolution Slider 2 built in , it is the perfect choice for any website you can imagine of. Item Reviewed: Merito The Joomla Multipurpose Template 9 out of 10 based on 10 ratings. 9 user reviews.